The standard Mbox sits in the middle of Avid's new range. Avid has updated its range of Mbox recording systems, announcing new versions of the standard, Mini and Pro versions. 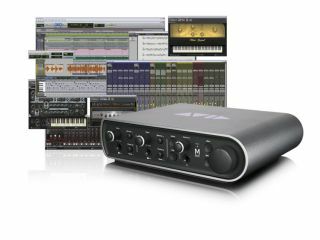 As before, all three Mboxes ship with Pro Tools LE and a decent bundle of plug-ins: the differences between them lie in the hardware. The compact Mini, for example, offers 2-in/2-out operation at a maximum 24-bit/48kHz resolution, while the Pro is an 8-in/8-out device that delivers 24-bit/192kHz performance. The standard model is a 4-in/4-out interface that supports 24-bit/96kHz recording. If you want to make detailed comparisons, check out the Mbox family page on the Avid website. One thing you might notice is that there's currently no successor to the Mbox 2 micro, the USB stick-sized interface that's designed for laptop use. Although the specs for the three new Mboxes don't look a million miles away from their predecessors, Avid claims that they've been built "from the ground up" with "completely redesigned analogue signal paths". Whether this will result in markedly improved performance remains to be seen. One obvious change is in the way the third-generation Mboxes look: they now have a grey and black finish and bear a resemblance to some of M-Audio's interfaces (M-Audio, of course, is another Avid company). Interestingly, it also seems that Avid is keener to stress the Mbox's compatibility with other software than it was in the past, recognising, perhaps, that not everyone wants to use Pro Tools. All the new models are available for order or pre-order now on the Avid website: the standard Mbox costs £587.95; the Mbox mini is £334.95; and the Mbox Pro will set you back £757.95.